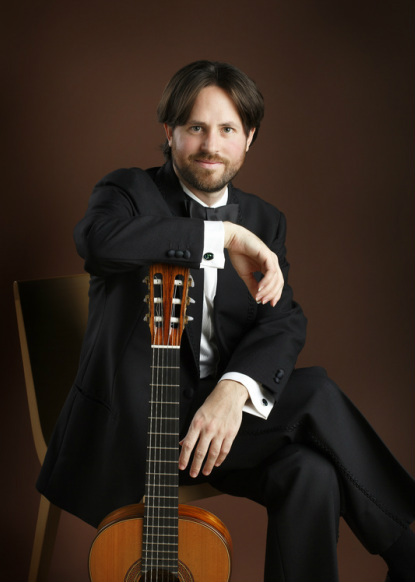 He has appeared as soloist with the Las Colinas Symphony, the Arlington Symphony, the Garland Symphony, the Orquestra Simfònica de Balears “Ciutat de Palma” and the Orchestra dell’Accademia l’Ottocento, and his performances have “demonstrated how much poetry and feeling can be obtained from the guitar in the hands of master musicians such as Jacob Cordover.” (The Mercury, Australia). As a recording artist, Mr. Cordover has released two solo CDs to much critical acclaim; Stélé (independent release, 2004) was hailed by Classical Guitar Magazine (UK) as “wonderfully sympathetic and highly accomplished... Cordover managing to get to the very soul of this striking and brilliant music.” His most recent solo release Blackwattle Caprices (Cala Records, 2013) received the following review in the American Record Guide “His technique is flawless. His expression tasteful and always interesting and moving.” Mr. Cordover has also released two CDs with his long standing chamber ensembles; Songs from the Forest, (independent release, 2012) the debut CD from the Australian Guitar Duo (with Rupert Boyd) and Historias (Cala Records, 2014) the debut CD from Zoco Duo (with Laura Karney, oboe/cor anglais). As well as receiving rave reviews, all of his CDs have been broadcast on radio stations in Asia, North America and Australia. His music has been used in television, he has been broadcast on radio stations and he has been a prize winner at major national and international music competitions including the Concurso Internacional de Guitarra Festival de Córdoba (Spain), the Sydney Performing Arts Challenge (Australia), the Australian Guitar Competition (Chamber Music Section), the Certamen Internacional de Guitarra de Barcelona (Spain) and the Performing Australian Music Competition (London, UK). For more information about Jacob, visit his website.